Our latest breakthrough with graphene could bring safe drinking water to millions – news that has captured the imagination of one of the world’s most famous entrepreneurs, who sees its potential for safer, greener air travel. The revolutionary properties of graphene, one atom thick and 200 times stronger than steel, have been inspiring scientists ever since they were first isolated by Sir Andre Geim and Sir Kostya Novoselov at The University of Manchester in 2004. But it’s not just academics who’ve wondered at this wonderful 2D material. The stories of its potential applications, from mobile communications to racing cars, have attracted visitors to Manchester ranging from the President Xi Jinping of China to the Duke and Duchess of Cambridge. The latest big name to sit up and take notice is Sir Richard Branson, founder and owner of the Virgin Group, who tweeted and blogged about his excitement about graphene following our latest breakthrough. It made headlines across the world: it’s now possible to make saltwater drinkable. A group of researchers from the National Graphene Institute at the University, the reports read, had used graphene to remove common salts from seawater. The findings, first published in the journal Nature Nanotechnology, demonstrated the real-world potential of using a graphene-oxide membrane as a sieve to filter salt from water cleanly and cheaply. The health benefits of this could be huge for those who need it most. Right now, UNICEF and the World Health Organization estimate that 10% of the world’s population (more than 660 million people) have no access to clean, fresh water. Every year, 315,000 children under the age of five die from diseases linked to poor sanitation. If the graphene-oxide membrane system can be built on a smaller scale, it could revolutionise water filtration around the world, making it accessible to countries that lack the financial infrastructure to fund large-scale desalination plants. It will now be tested against existing desalination membranes. 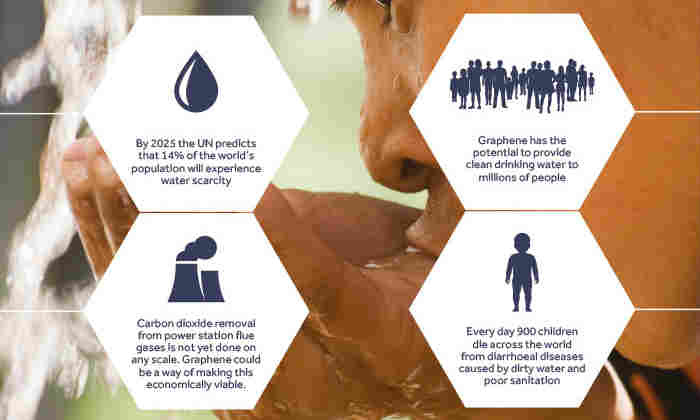 Developing this highly promising new graphene-oxide sieve could provide a genuine lifeline for millions of families struggling in water poverty in the developing world. News outlets from the BBC to CNN ran the story. It soon caught the attention of Sir Richard Branson, who suggested graphene technologies could help the world’s governments achieve global sustainable development goals. But it wasn’t just the material’s capacity for water desalination that inspired him. For Sir Richard, whose businesses include the Virgin Atlantic airline, graphene’s unique qualities promise a new generation of lighter, more efficient and environmentally cleaner aircraft – reducing the industry’s impact on our atmosphere. “Just as aluminium and carbon fibre provided huge step-changes for the industry, graphene could be the material that drives the next wave of much-needed innovation,” he wrote in his personal blog. The addition of graphene to the plastic within the wings of a plane can stop water getting in and adding weight, thus reducing fuel burn. Similarly, the heavy copper wiring and heating coils required for de-icing can be replaced with something much lighter and more efficient. “Reducing weight, fuel burn and improving safety should be at the top of the agenda for everyone in aviation,” he implored. As Sir Richard identifies, the importance of our relationship with the materials that make up the world around us is clear. From an end to water scarcity to reducing the carbon footprint of our travel, graphene is heralding a new age of discovery and invention. The research taking place into advanced materials at Manchester is fundamental to finding solutions to some of the most prevalent global challenges of our time.